This MP3 Download is a collection of audio recordings featuring Lama Zopa Rinpoche reciting the Sutra for Entering the City of Vaishali as well as other prayers and mantras. Buddha gave the Sutra for Entering the City of Vaishali to Ananda specifically to pacify harmful spirit that can contribute to pain and disease. 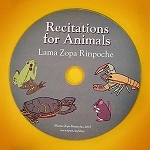 Lama Zopa Rinpoche offers this powerful collection of tracks to help alleviate anyone's pain. Combined play time: approx 4 hours. Please click here to download the written transcripts of this MP3 and here for the hardcopy CD. NOTE: These recordings were made at a patient's bedside and thus the quality is far from perfect. 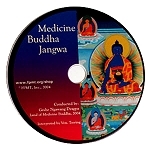 However, Lama Zopa Rinpoche has advised that merely by hearing the sutras and mantras that are recited on these discs pain can be relieved, regardless of the quality of the sound.